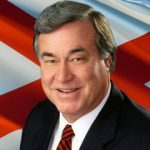 In my book, “Of Goats and Governors: Six Decades of Alabama Political Stories,” I suggest that based on seniority, tenure, power and prestige that Alabama’s greatest senators have been Lister Hill, John Sparkman, and Richard Shelby. The Chairman of the Senate Appropriations Committee makes the ultimate decision about how every federal United States dollar is spent. Alabama has never had a U.S. Senate Appropriations Chairman in our 200-year history. If truth were known, one of the reasons the Mazda/Toyota plant, with over 5000 high paying jobs, chose Huntsville was because of Richard Shelby. I am here to tell you that is big news for Alabama. There is no state in America that is more reliant on federal dollars for defense installations, defense research and defense related employees than the good old Heart of Dixie. Twinkle Cavanaugh is poised to win the Lt. Governor’s race. When the dust settles in November my prediction is that we will have a female governor and a female Lt. Governor, but more importantly we will have Richard Shelby as our senior U.S. Senator for at least four more years.